One of my favorite things about the holiday season is all the wonderful food served around the holiday table. Scrumptious roasts, glazed hams, roasted chickens, succulent pork tenderloins – I love them all. And then, of course, there are the amazing sides that accompany those main dishes – oven-roasted veggies, wonderful stuffings + dressings + grains, + my personal favorite: the potatoes! I was put in charge of making mashed potatoes for our family Thanksgiving this year + took to Facebook to ask for your suggestions on what type to make. Y’all had some amazing suggestions, but one recipe that kept popping up was The Pioneer Woman’s Delicious, Creamy Mashed Potatoes. In that recipe, either Russets or Yukon Golds are boiled, then mashed simply with lots of butter, heavy cream, cream cheese, seasoned salt, salt, + pepper. They looked simple + delicious, so I gave ’em a try. And y’all, they were SO good. So creamy, so rich, so buttery – they are as decadent + comforting as mashed potatoes can be. The cream cheese is what makes them special, adding a lovely, slightly tangy flavor, + a silky, rich texture. So, if you’re looking for a fab mashed potato recipe to try soon, look no further, + give this one a try! Turn off the heat and add 1 1/2 sticks butter, the cream cheese, heavy cream, seasoned salt, kosher salt and pepper. Mash to combine. Spread the potatoes in the prepared baking dish. Throw pats of the remaining butter over the top of the potatoes and bake until the butter is melted and the potatoes are warmed through, 20 to 30 minutes. I love adding cream cheese to my mashed potatoes – goat cheese is pretty amazing too. I needed a good mashed potato recipe. Now I have it! These look creamy and delicious. Oh so good! Thank you for sharing! I have a weakness for mash potatoes! And I love using heavy cream and cream cheese here. YUM, love that creamy goodness. Thanks for sharing this with us Amy. Have a good rest of the week! These sound so wonderful and rich; perfect for a holiday side! I LOVE mashed potatoes. I will totally pick another serving of them over dessert! These look amazing and I can’t wait to try them. Oh Amy, these look incredible! I love that you added heavy cream and cream cheese! These must be the fluffiest, softest mashed potatoes ever. A must-try in my kitchen! What a delicious side dish! 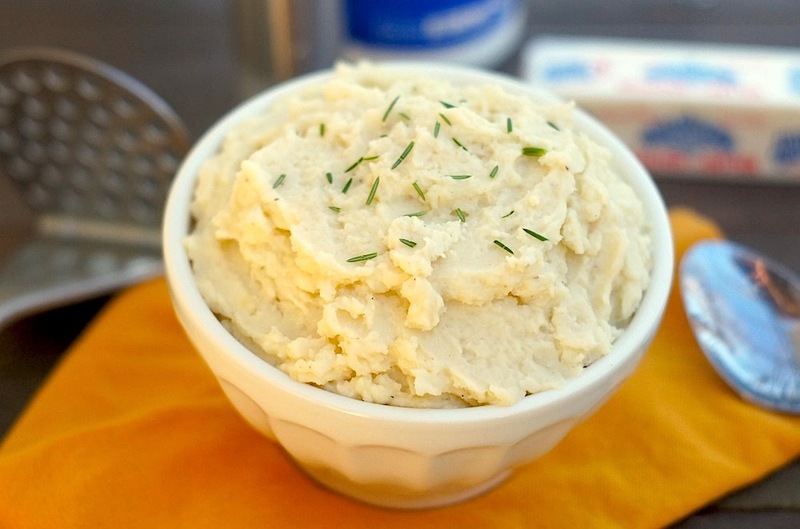 I love cream cheese or sour cream in my mashed potatoes – just the right tang! These look worthy of the fanciest holiday table. i’ve never had cream cheese in mashed potatoes, but I’m betting it’s fabulous! can’t wait to give this recipe a try!! Cream cheese rocks in mashed potatoes! I like to put mine in the crock pot to free up room in the oven–and my family requests these potatoes all year long. I’d probably skip the main and just stick to the bowl of this goodness! I love mashed potatoes, and I bet these are great! I just make them with russets, heated milk, butter, salt and pepper! These new additions sound fab! I love anything potato. This looks SO good! Nothing beats a big bowl of mashed potatoes on a cold winter night. This is a winner! This is how I have made my Holiday potatoes for 20 years. Very indulgent and delicious! Love your blog.